STAR OF The Sea, the much acclaimed theatrical adaptation of Joseph O’Connor's novel, and one of the hits of the 2014 Galway International Arts Festival, returns to the Galway stage in September. Star Of The Sea, adapted by Galway's Moonfish Theatre Company - Ionia Ní Chróinín, Grace Kiely, Zita Monahan, Morgan Cooke, Simon Boyle, and Máiréad Ní Chróinín - and co-produced with An Taibhdhearc, will run in An Taibhdhearc from Wednesday September 16 to Saturday 19. This will be followed by a national tour, taking in Dublin, Mayo, Kilkenny, Carlow, Kildare, Kerry, Tipperary, Sligo, and Meath. Set against the backdrop of the Irish Famine, the story moves between the Connemara landscape and the claustrophobic confines of a Famine ship - the Star of the Sea. The ship is sailing for New York. Among the passengers are maidservant Mary Duane, the ruined Lord Meredith, and Pius Mulvey, a ruthless murderer. Their lives and fates are more connected than any of them know, creating a gripping story of revenge and forgiveness. 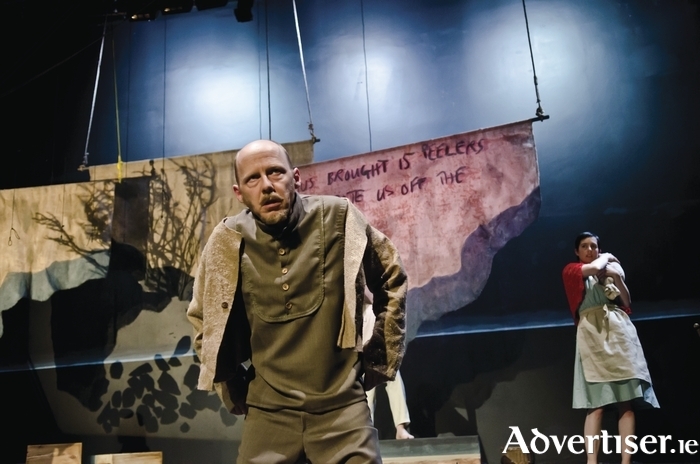 Moonfish’s production asks what happens when a society is put under immense pressure? What are the ethical choices facing individuals in such a time? And what has been the Famine’s lasting effect on Irish culture, in particular, the Irish language and music? It has been called “a lesson in theatre magic" by the Irish Daily Mail and "gorgeously assembled theatre," by The Irish Times. Joseph O’Connor said: "I found their version and their adaptation of it so moving and very emotional...and to hear those words spoken in the Irish language...was really something I'll never forget." The production is funded and supported by The Arts Council of Ireland, Foras na Gaeilge, Galway City Council, An Taibhdhearc, and Stroller’s Touring Network Production Award. Design is by Lian Bell; lighting by Matt Burke; with costumes by Cherie White.